Kait Lang - Thompson Law, P.C. Kait joined the Thompson Law team in August 2017 as Executive Assistant. Working directly with Carolyn Thompson and the staff of Thompson Law, Kait performs administrative and clerical assistance to enhance workflow of the office. Prior to joining Thompson Law, Kait obtained a Bachelor’s Degree from Gustavus Adolphus College and an MBA from the University of Sioux Falls. 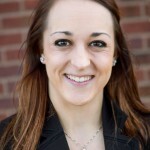 Kait was born and raised in Sioux Falls and enjoys coaching health and exercise classes in her spare time.